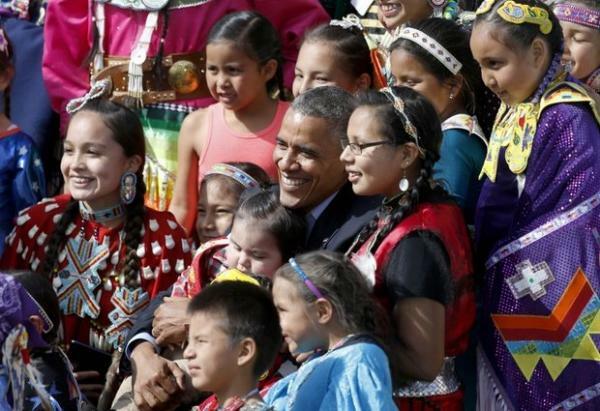 President Barack Obama poses with Native America dancers during his visit to the Standing Rock Indian Reservation Friday, June 13, 2014, photo in Cannon Ball, North Dakota. President Barack Obama’s 2016 budget request includes $1 billion to transform American Indian education, a $138 million increase from the current funding level. The $138 million increase would include $58.7 million for school repairs and replacement; an initial $34.2 million to deliver broadband access to all BIE schools; an additional $20 million for operations and maintenance at Indian school facilities; $75 million (an increase of $12.9 million) to fully fund tribal costs for running their own education programs; an additional $10 million “to incentivize creative solutions to school transformation”; and $2.6 million to improve school administration. The increased American Indian/Alaska Native education funding request is part of the launch of the president’s Generation Indigenou sinitiative intended to reduce barriers to success for Native American youth. The Gen I initiative also includes a small increase for scholarships and adult education, $3 million to support 60 new tribal youth projects in natural resources, a $15 million increase for the Tiwahe Initiative and $4 million to establish a One-Stop Tribal Support Center. Funding for Native Youth Community Projects would increase by a whopping $50 million (up from $3 million) to improve college and career readiness among Native youth. Interior Secretary Sally Jewell; Assistant Secretary for Indian Affairs Kevin Washburn, Chickasaw; Education Secretary Arne Duncan; and Jodi Gillette, special assistant to the president for Native American affairs, held a teleconference on January 29 to begin to create public support for the education initiatives. Jewell noted that the president’s recommendations would provide the highest level of funding for AI/AN education since the American Recovery and Reinvestment Act of 2009. U.S. Rep. Tom Cole, Chickasaw, a Republican representing Oklahoma’s 4th District, said in a statement: “Throughout President Obama’s tenure, Native American issues have proven to be a source of bipartisan cooperation, particularly on the House Appropriations Committee… In the days ahead, as my colleagues in the House and Senate seek to find common ground with the Administration, I remain hopeful that we can make significant progress in Indian country during this session of Congress.” Cole serves as chairman of the House Appropriations Subcommittee on Labor, Health and Human Services, Education and Related Agencies and on the House Budget Committee. Congresswoman Betty McCollum, D-Minnesota, said in a statement: “The Bureau of Indian Education has long been underfunded and meeting our trust and treaty responsibility for educating Native American children will not happen overnight… President Obama and Secretary Jewell have taken a significant action to set us on a path towards ensuring that all children in Indian Country have access to a safe place to learn.” McCollum is the ranking Democratic member on the Interior Appropriations Subcommittee and the Democratic co-chair of the Native American Caucus. In response to a question from ICTMN about whether other AI/AN programs would be cut in order to fund the education initiative, Washburn responded, “We have not made significant compromises” in developing the budget. Jewell said the president’s commitment to the American Indian community, based in part on his June visit to the Standing Rock Sioux Reservation in North Dakota and December’s White House Tribal Nations Conference, was instrumental in developing the FY16 budget requests for AI/AN education. She noted that the administration would launch a Cabinet Native Youth Listening Tour next week to hear directly from AI/AN kids. This entry was posted in News, Top Story and tagged Indian Education, Native American Youth, President Obama, students, Tribes, youth by Kim Kalliber. Bookmark the permalink.